Gerard Schwarz is an American conductor. 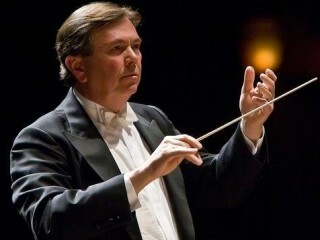 He was music director of the Seattle Symphony Orchestra from 1985 to 2011. Widely known as the director, since 1984, of New York's popular Mostly Mozart festival, trumpet-virtuoso-turned-conductor Gerard Schwarz is a musician whose versatility matches his refinement, elegance, and sense of balance. Often hailed as a passionate champion of American music, he also conducts the standard classical repertoire with consistent finesse and flair, bringing his profound knowledge of music to his interpretation of works ranging from the symphonies of Mozart to compositions by such leading twentieth-century composers as Andrzej Panufnik, Walter Piston, Howard Hanson, Alan Hovhaness, and David Diamond. Schwarz's background as an instrumentalist is not unusual: many conductors have started their musical career as orchestral musicians. Schwarz, however, had a stellar career as an instrumentalist. Writing in the American Record Guide, critic Barry Kilpatrick raved about Schwarz's artistry as a trumpeter, describing his playing as "a complete mastery that transcends the usual limits of the instrument." As a conductor, Schwarz applied his ability to create a beautiful instrumental tone to the entire orchestra. Thus, as critic Robert Jordan asserted in Opera Canada, in his review of the Seattle Opera 2002 production of Richard Strauss's Salomé, "conductor Gerard Schwarz filled the entire Mercer Arts Arena with a sheen of sound, voluptuous and seductive but beautifully calibrated, so the singers were always audible." Jordan concluded by stating that, "Musically, this Salomé was virtually beyond reproach." Born on August 19, 1947, in Hoboken, New Jersey, Schwarz studied with the great trumpeter William Vachianno from 1962 to 1968, launching a professional career while still in his teens. In 1965 he joined the American Brass Quintet, remaining with the group until 1973. With the American Brass Quintet, Schwarz toured the world, also playing trumpet in various orchestras. Having also studied composition with the noted American composer Paul Creston, Schwarz developed an interest in contemporary music and urged composers to write for his instrument. His reputation as a virtuoso was so solid that the New York Philharmonic Orchestra offered him the position of co-principal trumpet without even requesting an audition. Schwarz accepted the post, replacing his teacher, Vachianno. A conductor since the late 1960s, Schwarz enjoyed such success that he faced a choice between two careers. The decision was made in 1977, when he resigned his New York Philharmonic Orchestra post, devoting all his energies to conducting. That year, Schwarz helped found the New York Chamber Symphony, becoming the ensemble's music director, a post he held until 2002. During his career as a conductor in New York, Schwarz won popular and critical acclaim for his energetic and imaginative musicianship and leadership. In the highly competitive world of classical music, in a city where orchestras need more than talent to survive, Schwarz not only inspired orchestras to reach for perfection but also brought classical music to a wider audience, sharing his immense enthusiasm with the public. Schwarz's association with the Seattle Symphony started in 1983, when he accepted the post of musical advisor. The Seattle Symphony was a respected orchestra, but Schwarz's colleagues in New York thought that cultivating ties with Seattle was a terrible career move. After all, New York is the capital of classical music. However, Schwarz decided to ignore common wisdom and accepted, in 1985, the post of music director of the Seattle Symphony. Schwarz's gamble, if it was a gamble, has paid off: not only has his career flourished, but the Seattle Symphony attained the status of a world-class orchestra, recognized for its unique rich sound. During his tenure, Schwarz has not only conducted a large repertoire of standard works but has also performed many contemporary American works, establishing the orchestra's reputation as a great American ensemble. In addition to ten Grammy Award nominations, the orchestra received, in 1996, the first-place award for programming of contemporary music from the American Society of Composers, Authors and Publishers (ASCAP). Schwarz is also known for conducting premieres of important works, including Arbor cosmica and Symphony No. 10 by the twentieth-century Polish composer Andrzej Panufnik. In addition to conducting symphonic music, Schwarz has received considerable critical acclaim for his work with soloists, as a conductor who understands the particular needs and idiosyncrasies of concert soloists. He has also, since 1982, conducted a large number of opera productions. In 1983 Schwarz conducted the American premiere of Richard Wagner's opera Das Liebesverbot. The year 1986 marked his Seattle Opera debut, with Mozart's witty Così fan tutte. Schwarz's work as an opera conductor encompasses many acclaimed productions, including such classical works as Mozart's Die Zauberflöte, Le nozze di Figaro, and Don Giovanni; Beethoven's Fidelio; and Verdi's La Traviata. Dedicated to reaching beyond the concert auditorium, Schwarz has consistently, ever since his days as a trumpet virtuoso, made recordings for several prominent labels. While his recordings comprise a wide repertoire, contemporary music, particularly music by American composers, stands out. For example, his 1989 recording of music by the American composer Howard Hanson (1896-1981) received a record of the year award from Stereo Review. While Schwarz has established himself as the preeminent interpreter of works by contemporary American composers, such as David Diamond, Walter Piston, and Alan Hovhaness, he is particularly esteemed for his performances of works by Hanson, whose opulent, almost visual, orchestral sound is the kind of musical challenge that a conductor like Schwarz truly welcomes. A true ambassador of classical music in a world dominated by popular culture, Schwarz has not hesitated to use the popular media to spread his message. His numerous radio and television appearances include educational programs, telecast performances, and broadcasts of many great works of music. In 1993 Schwarz received a Northwest Regional Emmy Award for a KCTS-TV Seattle presentation of a program entitled A Romantic Evening. In 2001 Schwarz directed, with composer Bright Sheng, Fusion--West to East: East to West, the Seattle Symphony's popular Pacific Rim Festival. The following year, praising his exceptional work as a conductor of American and contemporary music, ASCAP cited Schwarz as an example of "the ideal American conductor." In 2003, the year he celebrated two decades with the Seattle Symphony, Schwarz received the very first "IMPACT" award, for lifetime achievement, from the Pacific Northwest Branch of the National Academy of Recording Arts and Sciences. His numerous awards include Musical America's Conductor of the Year in 1994 (the first American to win that award), 13 Grammy nominations, and 3 Emmy nominations (2 of which resulted in Emmy wins) for his performance of Mozart's Requiem on Live from Lincoln Center and performances with the Seattle Symphony on PBS. He received Seattle's City of Music Outstanding Achievement Award for 2010. -The Sound of Trumpets Delos, 1983. -(Howard Hanson) Symphony No. 4 Delos, 1991. -(Bela Bartok) Concerto for Orchestra Delos, 1992. -(Ludwig van Beethoven) Symphony No. 6 "Pastoral," Delos, 1992. -(Wolfgang Amadeus Mozart) Symphony No. 41 "Jupiter," Delos, 1992. -(Franz Schubert) Symphonies Nos. 5 and 8 Delos, 1992. -(Richard Strauss) Thus Spake Zarathustra Delos, 1992. -(Franz Josef Haydn) Concerto for Trumpet Delos, 1994. -(Alan Hovhaness) Symphony No. 1 Delos, 1995. -(Alan Hovhaness) Prayer of St. Gregory Delos, 1997. -(Andrzej Panufnik) Symphony No. 10 (world premiere), JVC, 1998. -(David Diamond) Symphony No. 3 Naxos, 2003. -(Alan Hovhaness) Mysterious Mountains Telarc, 2003. -(Walter Piston) Symphony No. 4 Naxos, 2003. View the full website biography of Gerard Schwarz.